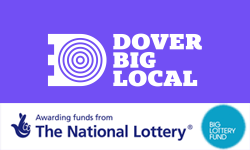 This area of focus for Dover Big Local was originally called Sports and Leisure; however, over the course of our first few years it became clear that we needed to broaden the focus to cover the more general topic of health and wellbeing so as not to miss a proportion of our residents. By changing this focus we recognised that this stream is the “glue” that binds the others into a whole. It is clear that to have the greatest impact on our residents we have to focus on basic building blocks of health and wellbeing using the other and provide support to projects that deliver one or more of these. As part of delivering this we offer a wide variety of projects, opportunities and experiences including, coffee mornings/social groups – such as DBL Stitching Group, free advice sessions advice clinics rota, cookery sessions, fitness sessions, a wide variety of formal Training Courses and the chance to volunteer or run your own projects; pop into the Hub to find out more and to connect. Dover Big Local works in partnership with Live Well Kent hosting a Free Advice Clinic every Tuesday 10-4 to help you resolve issues around Housing, Health, Benefits and Welfare. Live Well Kent can also help you improve your everyday living, become more independent and confident, meet new people, get better skills or find a job; keeping active and healthy, meeting people and everyday living. We have recently launched a Repair Café in partnership with Future Foundry and Transition Dover providing the opportunity for people to not only get household items repaired but to share/learn skills. It is important to stress that we also have not forgotten sports and leisure, which in many ways fit into the above model, and we are working very closely with the local skateboard community and the District Council to plan develop and deliver a new skate park facility for Dover. We are also supporting “100 miles for 100 years” walking project, a Kent wide project that has arranged a wide range of self-guided walks around Kent, including 3 based in Dover, to celebrate the centenary of World War 1, that launches here in Dover on 25th February; running up to November. Posters regarding the walks, links to their on-line guides etc will be available in the DBL Hub in the Charlton Centre. Remember, we are here for you and to help you deliver the changes you want to make your community an even better place to live, work and play; so please come to the Hub, connect with us, share your views/ideas and bring your project ideas along too.